I have SUCH an exciting and highly-requested tutorial for you today, sweet friends! Ever since I found the faux mantel that now lives in my bedroom, so many of you have asked where you might be able to find something similar. The mantel I bought was handmade and a very simple design, so I knew that I could come up with a plan to build something close that would be much less expensive than some of the real mantels you’ll occasionally come across at antique stores. They can get outrageously pricey! 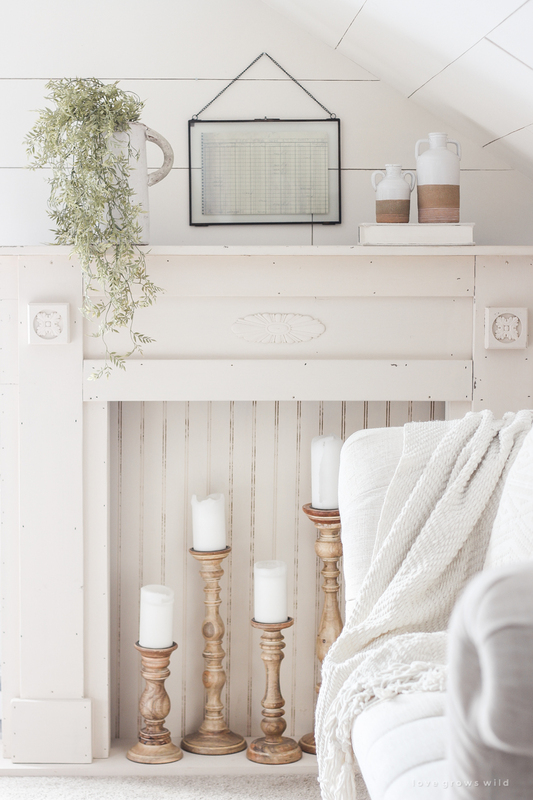 I built this DIY Mantel using only 1x pine lumber, which is very affordable and easy to work with, and it has such a beautiful, simple farmhouse look that would work well in any style of home. I’m so excited to share this tutorial with you guys, so let’s get started! 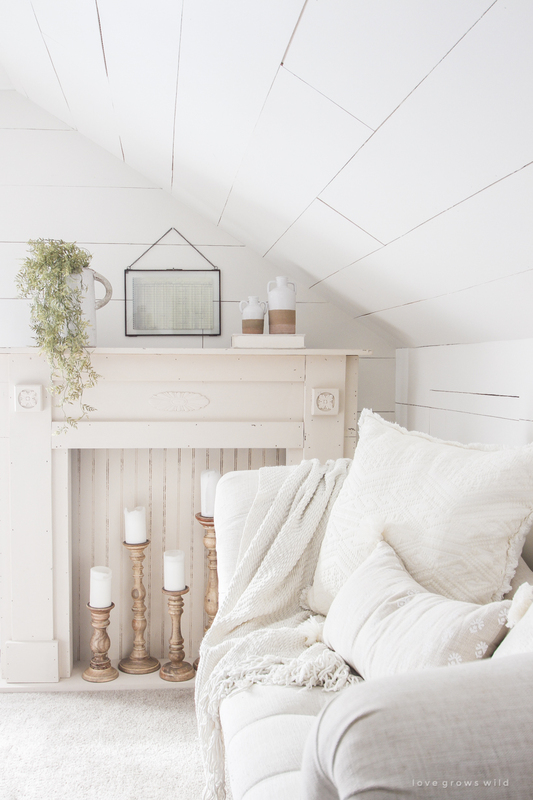 So first, funny story… I originally built this mantel with the intention of selling it at my shop, Love Grows Wild Market. But as I was styling it for photos, I realized it literally was the PERFECT piece for this space in my living room. I’m SO happy with how it turned out and fell in love with how this made my living room look and feel, so now I get to build another one because this beauty has to go to the shop this week! 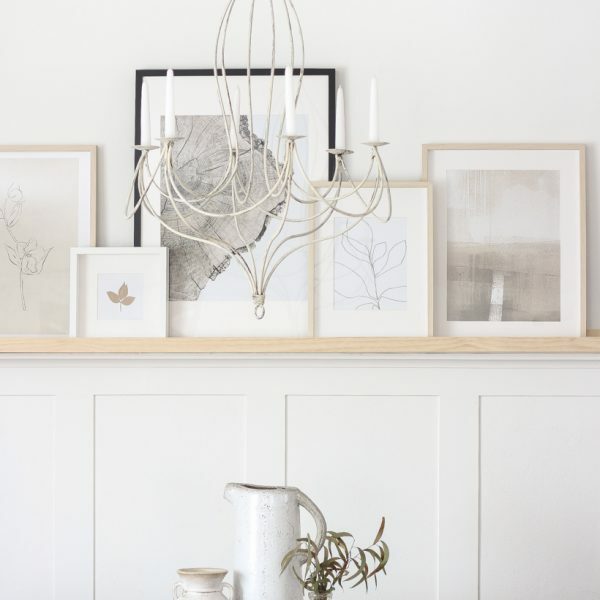 The shape and structure of both mantels are the same, but the one in my bedroom just has a few more decorative elements that are optional and very easy to add if you like this look. The decorative pieces on top can be found either in the wood trim section of your hardware store or in a craft store. And I also added a piece of bead board to the back painted in the same color as the mantel, which adds a little bit of pattern and more of a farmhouse feel. 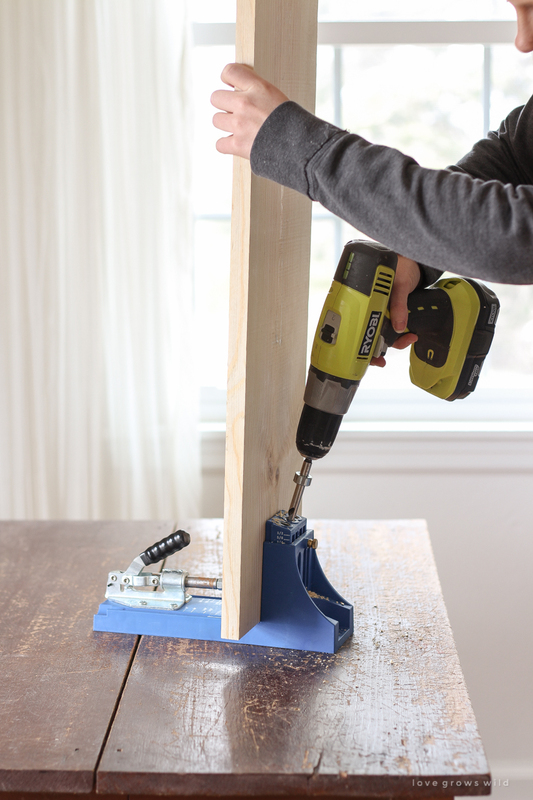 Drill ¾” pocket holes in one end of both 1×10 main frame legs. 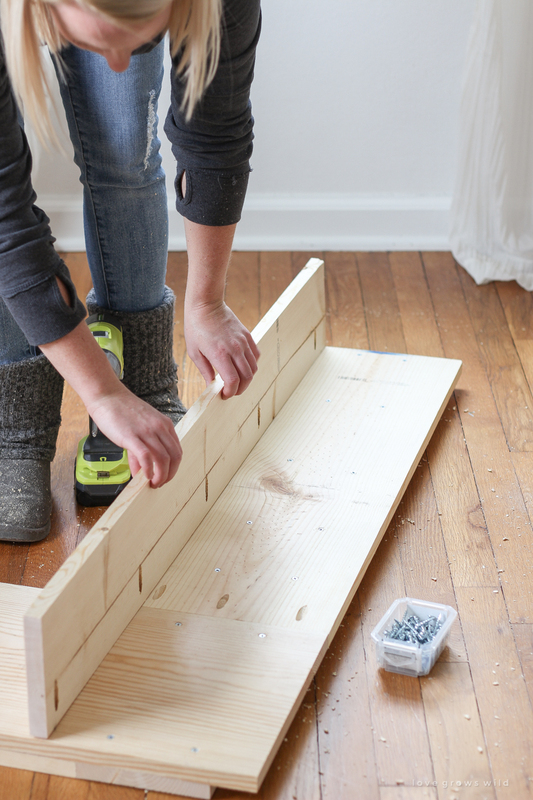 On a large flat surface, lay out the 1×12 main frame top and both main frame legs and use wood glue and 1 ¼” pocket hole screws to attach the 1×10’s to the 1×12. The outer edge of the 1×10’s should be flush with the ends of the 1×12. To build the face frame, first drill ¾” pocket holes in both ends of both 1×4’s. On a large flat surface, lay out the two 1×6 face frame legs with the 1×4 top face frame board running horizontally in between. The outer edge of the 1×4 should be flush with the ends of the 1×6’s. 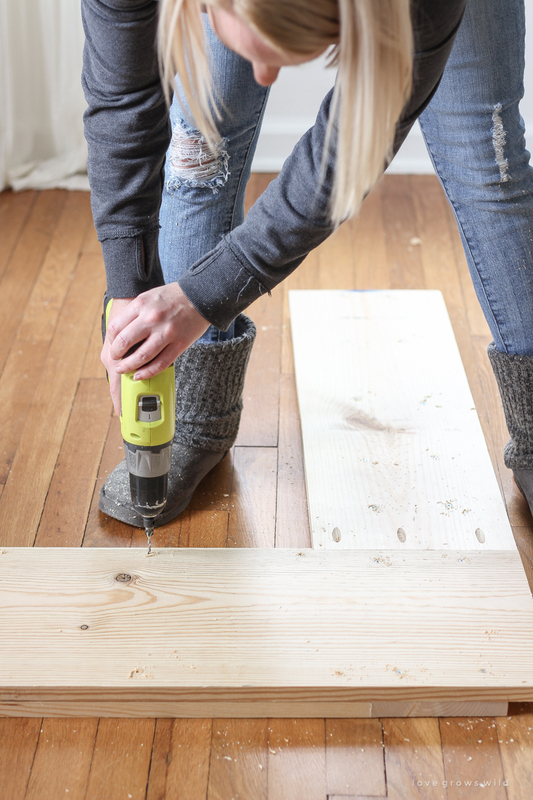 Measure 6” down from the bottom of the 1×4, and make a mark. Position the top of the other 1×4 at that mark (it should cover the seam between the 1×10 legs and 1×12 top on the main frame). 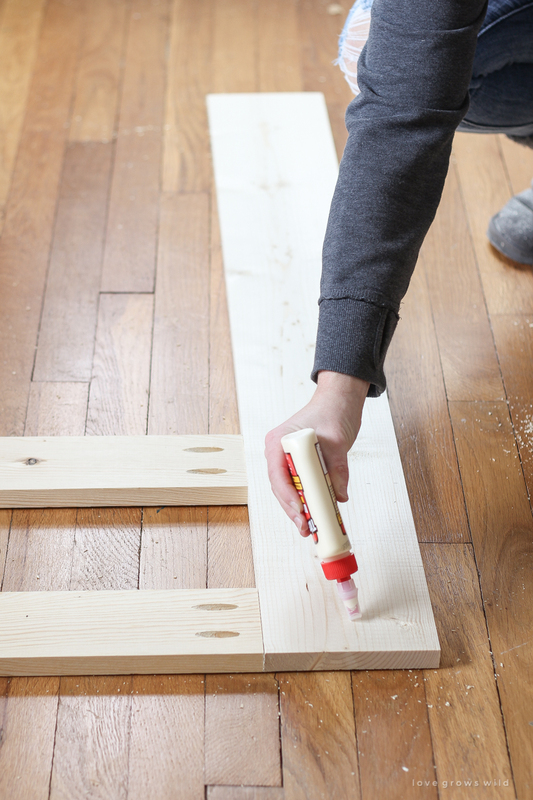 Use wood glue and 1 ¼” pocket hole screws to attach the 1×4’s to the 1×6’s. Attach the face frame to the front of the main frame (the side without the pocket holes) using wood glue and regular 1” wood screws inserted from the back of the mantle. Make sure the face frame legs are centered on the 1×10’s. 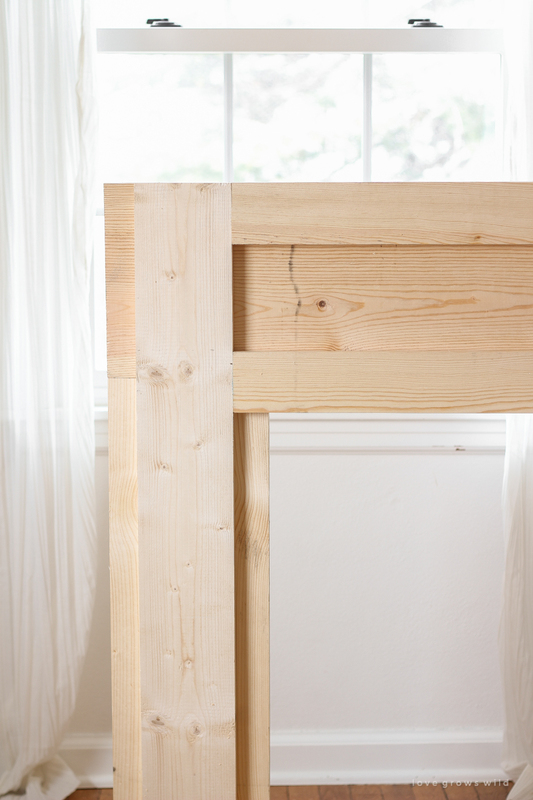 To add depth to the mantle, attach four 1×6 boards to the back (the side where the pocket holes and screws are showing). 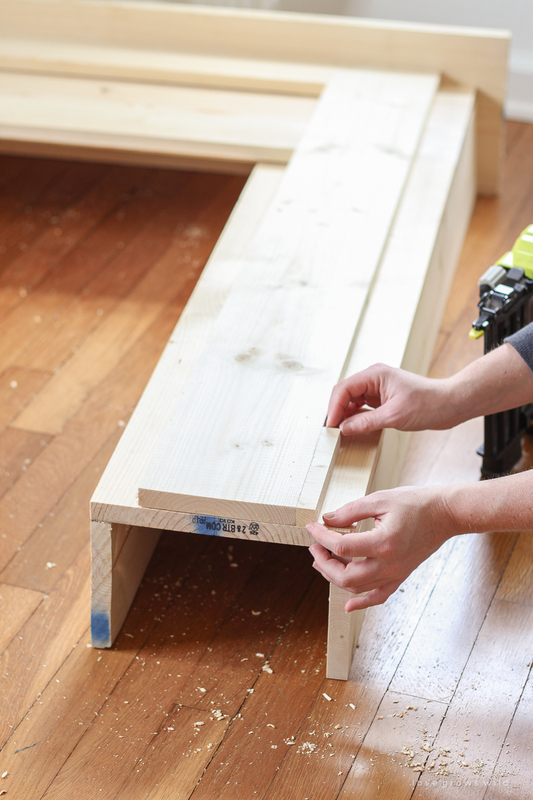 Start by drilling ¾” pocket holes along one long edge and along the top of all four 1×6 boards. The pocket holes on the top short edge will be for attaching the mantle top in the next step. 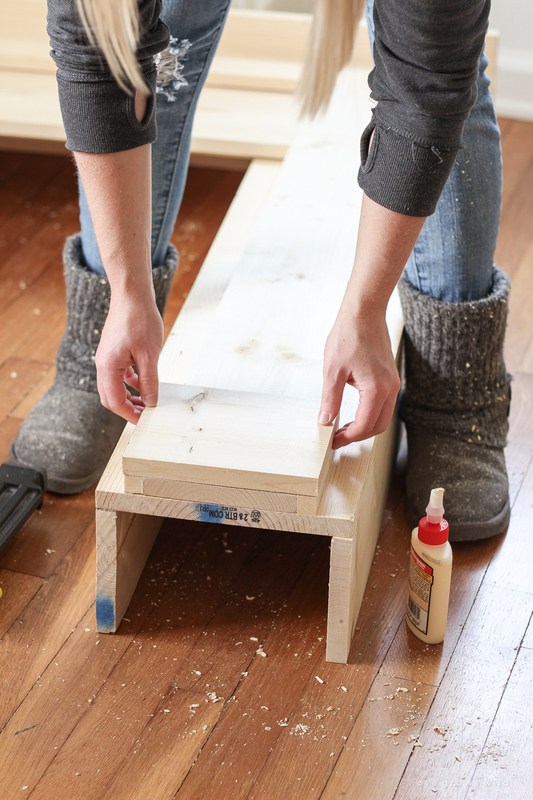 Be sure to drill all the pocket holes so they will be facing inward on the back of the 1×10 legs. 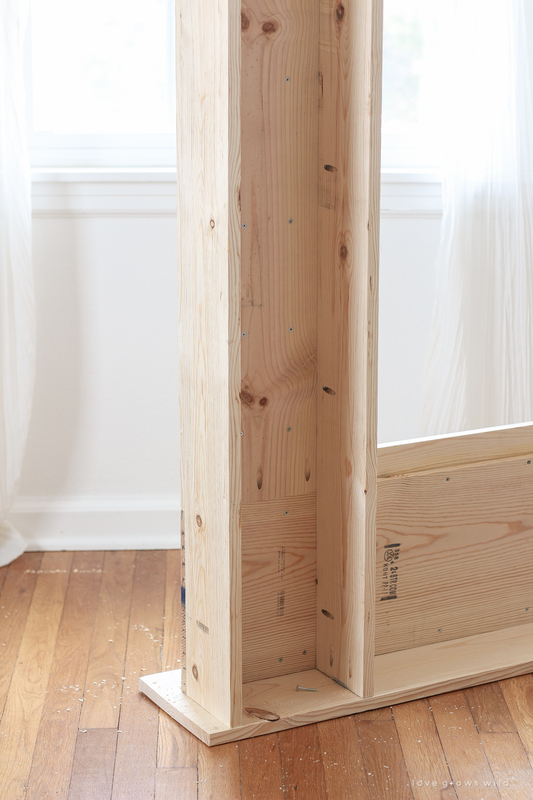 Attach the four 1×6’s to the back of the mantle as shown using wood glue and 1 ¼” pocket hole screws. 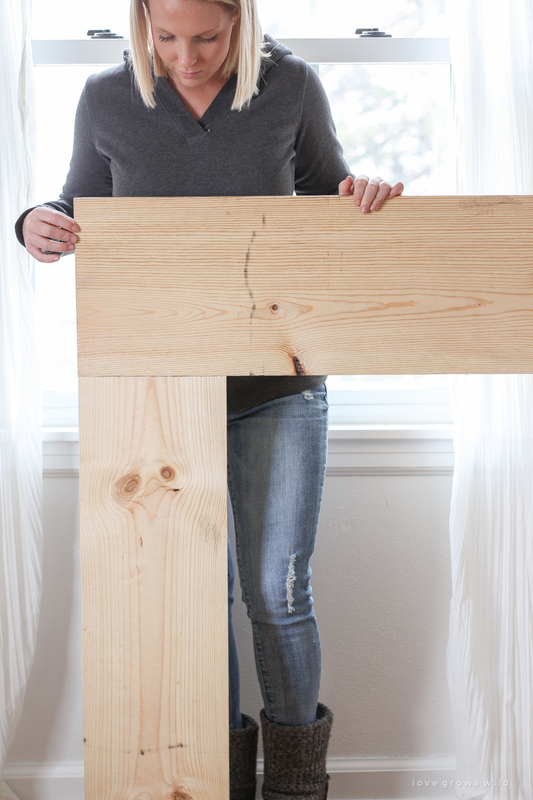 To attach the top mantle board, carefully flip the entire mantle upside down and position the 1×10 board underneath. There should be an equal overhang on both sides, and the back of the board should be flush with the back of the 1×6’s. 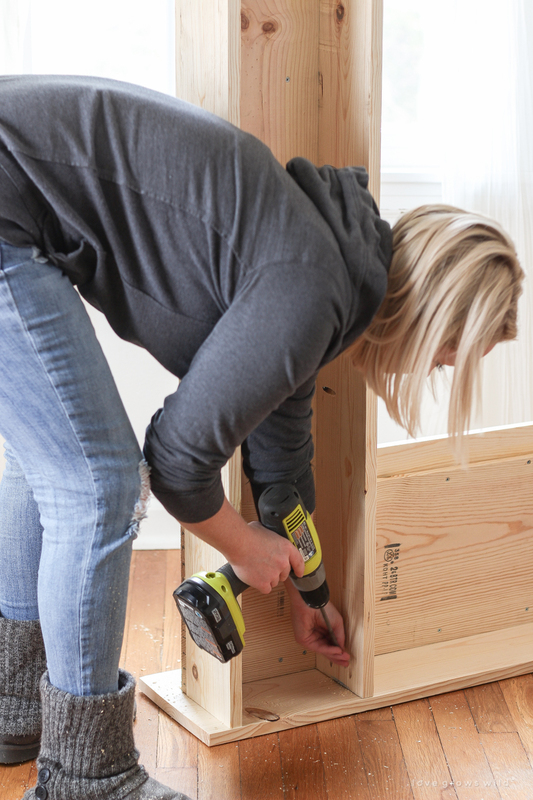 Attach the mantle top with 1 ¼” pocket hole screws going through the holes you drilled in the back 1×6’s in the previous step. To trim out the bottom of the face frame, first add a ¾” 1×6 trim piece on either side of the 1×6 legs. Since these pieces are so small, just use wood glue and 1 ¼” brad nails to avoid splitting the wood. 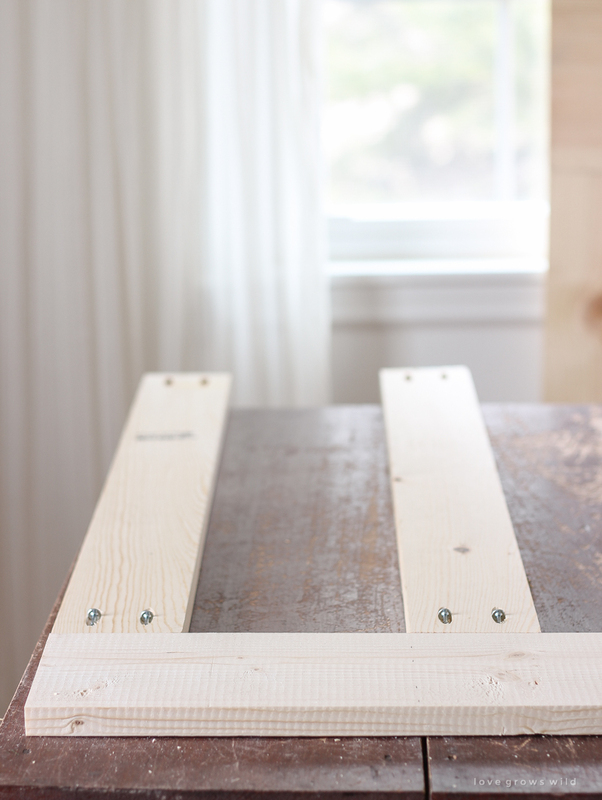 Then place the 7” 1×6 trim pieces on top of the face frame legs flush with the bottom of the mantel. Again, just use wood glue and 1 ¼” brad nails here. 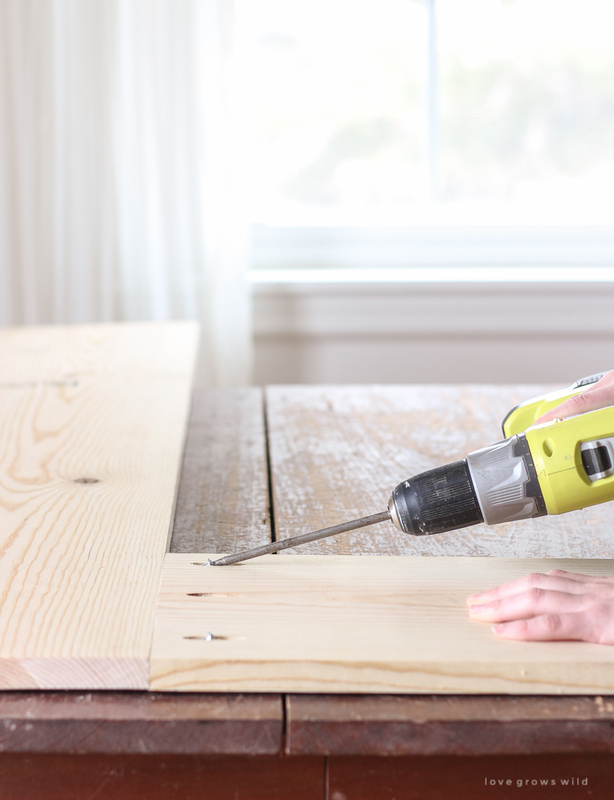 Fill any nail holes or gaps with wood filler and allow to dry completely. Sand the entire mantle, making sure that the bottom is completely smooth and even so it will not wobble. (I would still recommend securing it to the wall once you get it into place). Clean the wood well using a vacuum and damp rag to make sure all the sawdust is removed before finishing. 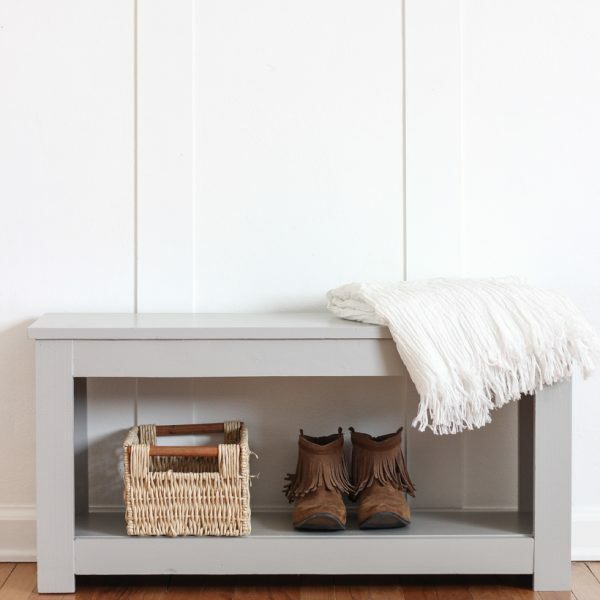 Either stain or paint the mantle and finish with a sealant such as wax or a matte poly. 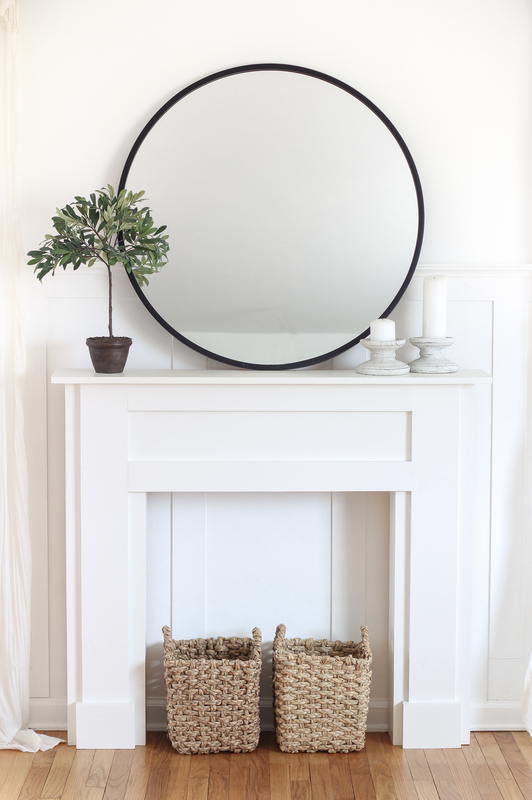 Note: I used Dutch Boy paint in the color Swan White on this mantel and sealed it with my #1 go-to, Varathane Clear Matte Interior Poly, which dries crystal clear and matte and will not yellow. For the mantel in my bedroom, I painted it with Miss Mustard Seed’s Milk Paint in a mixture of equal parts Marzipan and Linen. Can you please tell me where your large round mirror is from? Of course! I purchased the mirror HERE and love it! The plant came from Pottery Barn a few years ago!